Hominy corn is a marvel. It's the kind of corn used to make corn tortillas and grits. It’s big, fluffy, starchy, nutty and not at all sweet like smaller yellow corn. It’s really not something you can swap out in this recipe, so hunt through the well stocked markets & Mexican food shops where you live. I can only find canned hominy in Victoria, but dried is good too if you can get it. You will just need to treat it like beans: soak overnight and then boil in plenty of water until tender but chewy. If you can’t find this corn where you live, it’s worth doing an online order. It really makes the whole soup. I put a lot of tomatoes in this soup, which is not the most traditional way to make posole, but it’s really good. The other thing that really makes posole pop is lots of toppings. I like to add avocado slices, queso fresco or feta crumbles, cilantro and squeeze in lots of lime. Finely sliced radish, shredded cabbage and crispy tortilla strips are great too. It freezes really well, so I often make a big batch to freeze and take for my lunch. Just remember to pack a little toppings kit to take with you. A couple whole dried chilies, I think mine were guajillo, but, embarrassingly, I didn’t label my chili jar. Sauté the garlic and onion in a large heavy pot on medium heat until fragrant and beginning to colour. Add cumin and chili flakes and cook a few more minutes until very fragrant. Add tomatoes. Rinse chilies and soak for a few minutes in hot water. Add chicken stock, chicken breasts and soaked chilies. Increase heat and bring to a boil. Reduce heat to medium-low. Simmer until chicken is cooked through, about 20 minutes. Pull out the chicken and set aside to cool slightly. Using an immersion blender or food processor, purée the soup until all vegetables are completely incorporated. Add hominy corn to soup and heat on medium. Shred the chicken finely with two forks and add into soup. Heat through and serve in bowls, with lots of toppings. I have learned that soup, and lots of it, is the key to a calmer, more organized, Konmari-ish and just generally better life. Specifically, making lots of soup and keeping it in the freezer is the trick. There is an incredible soothing effect from having a filling, healthy meal always ready to go in about 10 minutes. Plus, they are pretty inexpensive and you can feel really smug about getting lots of vegetables. Especially as the holidays bear down upon us all like a huge, looming, twinkling thing - soup in the freezer is the way to stability. If you can manage to make more than one type and freeze both, so you have soup variety in your life, you level up. Might I recommend tortellini chicken soup, roasted tomato or cream of mushroom to add some variety? This soup is a great way to use up any straggler pumpkins left over from Halloween. If you have one hanging around, hurry up and use i or you might get an unfortunate liquefied pumpkin ooze mess, as I did this year. You can also use butternut, kabocha or any similar squash, or a mix. Heat oven to 400°. Halve the pumpkins and scoop out seeds and stringy pumpkin intestines. Brush with oil and sprinkle salt and pepper all over the flesh. Roast skin side down until flesh is very tender, about 1 hour. Let cool until the pumpkin isn't too hot to touch and peel off the skin. Set pumpkin flesh aside. In a large stock pot, sauté the garlic and shallots in 2 tbs oil. When the garlic and shallot are soft and starting to colour, add the cumin and coriander seed, and sauté a couple more minutes, until the spices are very fragrant. Add chicken stock and pumpkin. Blitz with an immersion blender or in a food processor until very smooth. Return to low heat and add cream and salt and pepper to taste. Serve with some fresh cilantro and a squeeze of lime. Freeze in single serve portions and rejoice. Pumpkin magic. Bibbity bobbity boo. This soup is a deluxe, upgraded version of classic chicken noodle soup. I love chicken noodle soup, especially if I'm feeling on the cusp of getting sick. I like it pretty classic, broth, shredded chicken, a couple thin carrot slices and a bit of parsley on top. For the ultimate cold remedy, I add A LOT of garlic and chili flakes, it really clears the sinuses. This essentially has the same elements, but all dialed up to 11. 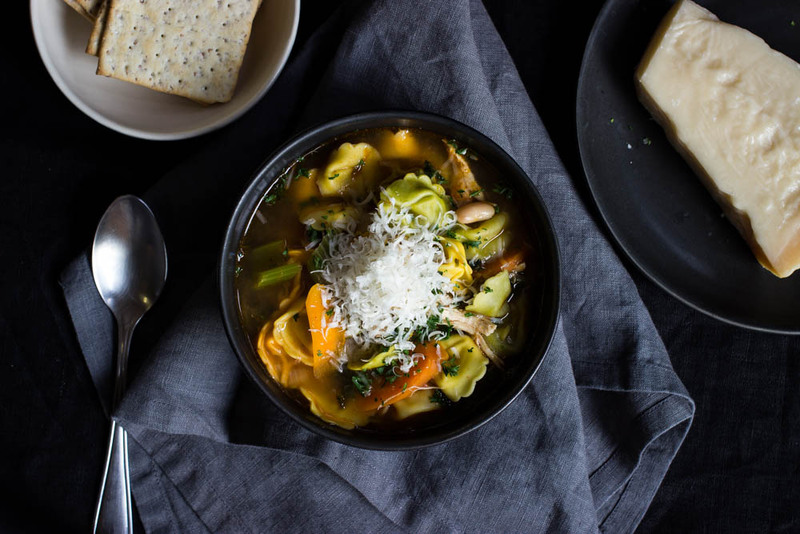 The soup gets a vegetable kick from celery, tomatoes and shredded kale, the broth gets a boost from a bit of tomato paste, and creamy white beans for a bit more protein. And the pasta gets the biggest upgrade: cheesy, plump pasta dumplings bobbing around cheerfully. I was a bit worried that the tortellini would go soggy after sitting around in the soup, but it held up really well. Even after freezing and reheating, it didn't turn into a mush. So save and freeze your leftovers at will. In a large heavy pot, heat oil over medium high and add garlic, shallot and chili. Sauté until fragrant and just beginning to colour. Add tomatoes and cook a couple more minutes. Add broth and chicken, reduce heat to medium and simmer until chicken is cooked through. Remove chicken breasts and set aside. Add beans and tomato paste to the broth. Finely shred chicken using two forks. Increase heat and bring soup to a boil. Add tortellini, carrots and celery. Cook about 2 minutes or until pasta is tender. Add kale and remove from heat. Serve with a big sprinkle of parsley and parmesan. I'm on a big soup tear. My goal for the fall and winter is to always have soup in the freezer, ready to go for toasty, hearty meals. It's super comforting to know that if I'm too tired to make dinner, I can just thaw out a soup and eat in ten minutes. It also helps me resist the siren call of take out to know that there is something tasty and healthy (or healthyish at least) in the freezer. This tomato soup has been in heavy rotation in the soup rota so far. It's perfect with a grilled cheese sandwich or a flaky cheese biscuit, both of which should be dunked into soup for an optimal dining experience. It freezes beautifully, so you can make a double batch and freeze it for your hunger emergencies. Don't worry about that large amount of garlic here, roasting it with the tomatoes makes it mellow, earthy and sweet and not at all sharp. You can cut it down if you really want to, but I wouldn't. I would add more, even. You almost certainly aren't eating enough garlic, unless you have an acute vampire-phobia. Roast the tomatoes, garlic and shallots, tossed in olive oil, salt and pepper, at 425° until the vegetables are softened and caramelized, about 25 minutes. Combine roasted tomatoes and garlic with chicken stock and cream and puré in a food processor or with an immersion blender. Heat in a pan over medium heat. Serve with some finely chopped basil and ideally, some hot cheesy biscuits. Fend off those vamps!